Especially happy because it's the first Friday of the summer! Woohoo!! 1. It has been so freaking hot here this past week. I am talking record breaking temperatures; everyday has felt 100+ degrees. Miserable. So, we have been playing outside, ummm, 0 times. Ella's toy room looks like a bomb has gone off. I want to go to the pool! Can it please cool off?! I'll take even low 90s at this point! 2. 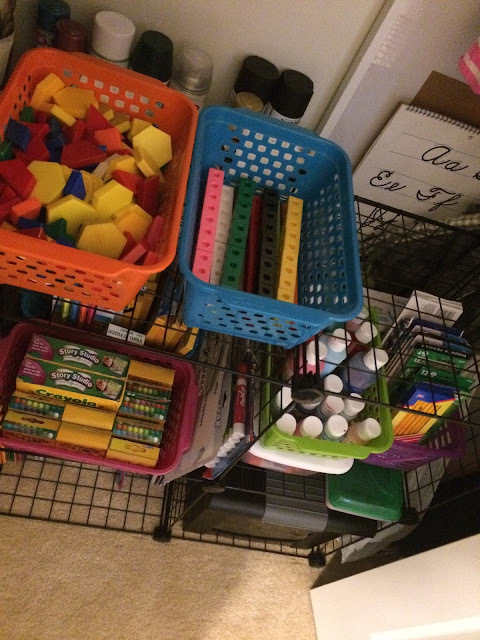 Since we can't go outside, I've been organizing the crap out of my stuff I brought home from school. 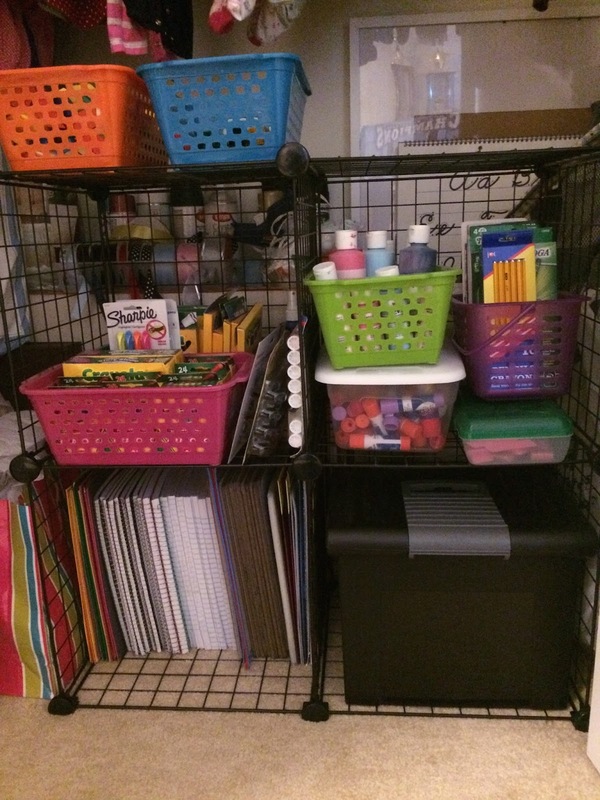 I got a huge bookcase and filled it with books from my classroom, and then organized all of my school supplies in our guest bedroom closet! Makes my little heart happy, seeing all those supplies organized! Now if only it would cool off so we could move the 4 huge tubs out of my family room and into the attic (no way in hell am I going up in that attic when it's 94484* out!!!)! 3. Anniversary flowers and my favorite wine from my husband on Tuesday?!? He's a keeper, I tell ya. 4. Sunday is the first day of summer (because it hasn't felt like summer all week or anything...)! Which means it's National Wear Your Lilly Day!! She was much easier to photograph last year! This year, she looks pissed. Ha! LOVE that cute idea with the DAD picture... might have to steal that idea! Stay cool and have a great weekend! 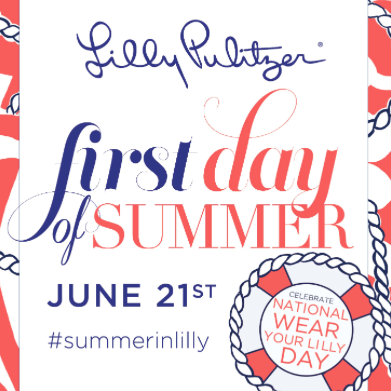 You guys are too cute with doing wear your Lilly for a whole week – I love that idea! 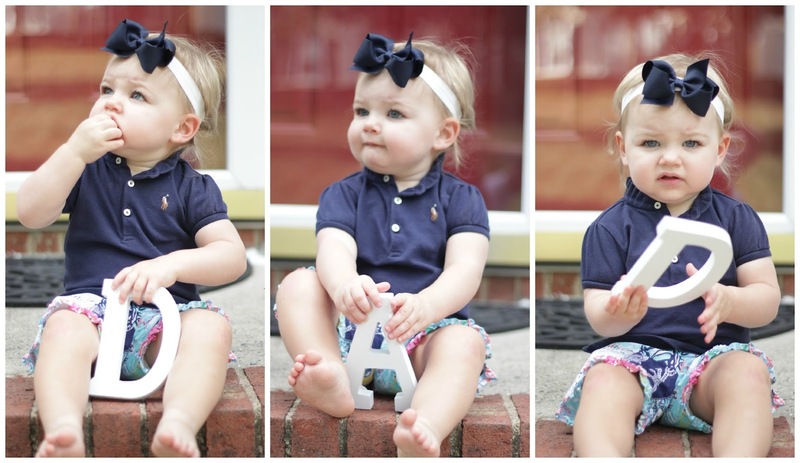 Oh my goodness, those photos of her spelling out Dad are the cutest! I'm so excited that I found out tomorrow is National Wear Your Lilly day so that Avery can participate!! Can't wait to see Ella's Lilly outfits!